Oh Fudge! What Came First? The Confection? Or the Verb? At Chutters, our homemade fudge is a family favorite that dates back to decades of pure, New Hampshire tradition. Fudge can be made in many ways, at varying complexities and flavor profiles. Unlike other desserts that date back thousands of years, fudge is a relatively new dessert that was created in the late 1800s. Today, fudge can be made with just chocolate and condensed milk at its simplest form. Chocolatiers often make fudge in its original form of chocolate, cream, butter, and sugar. The actual history of fudge is foggy, but it is known that it was invented in Baltimore around the end of the 1800s. The first written document that mentions fudge was written by a student at Vassar who was explaining that her friend’s cousin had made a bunch of fudge for a fundraiser and sold it for 40 cents a pound. Young people started to pick up on the trend and before you knew it, fudge became a popularly served candy dessert! Some people even say that fudge is in fact derived from Scotland’s treat, “tablet”. This is a grainier and harder version of fudge but is quite similar in many ways. Among today’s confection experts, they consider fudge to be a type of fondant. Not like the decoration on cakes, but more like the center of a peppermint patty. Since fudge was invented, places all over the country started making their own version of the confection. A small island in Michigan (Mackinac Island) actually claims to be the fudge capital of the world, with over a dozen fudge shops. The island is tiny, clocking in at about 4.35 square miles. At one point, Mackinac Island has a fudge master who offered a lifetime supply of fudge for anyone who was willing to pay $2,250 up front for the service. Another fact about fudge is that the largest slab of fudge was made by Northwest Fudge Factory in Levack, Ontario, Canada, on October 23rd, 2010. It weighed 5,760 lb! Chutters has been making hand made fudge in over a dozen creative and fun flavors for decades. 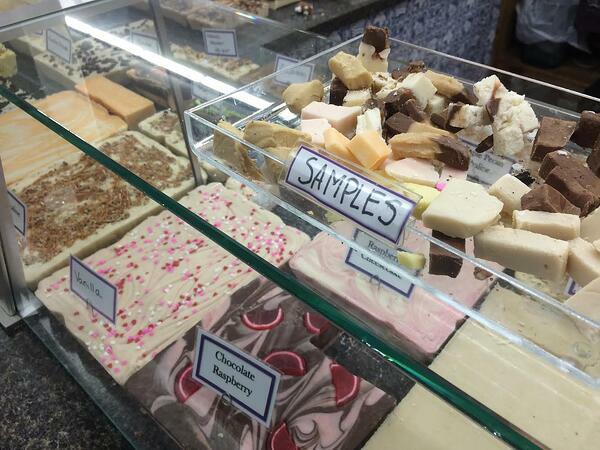 Chutters Candy Counter is known for their fudge, as there are always 20+ different varieties of fudge every day! From traditional flavors like maple walnut, penuche, and peanut butter, to more complex flavors like raspberry cheesecake and rocky road. National Fudge Day is June 16th, so come in and celebrate the confection with a square of your favorite flavor. Not sure what flavor to choose? We offer free samples every day. Fudge freezes well for a whole year, so feel free to buy in bulk and bring the treat home with you to enjoy for months. Not a fan of fudge? Chutters has the longest candy counter in the world, meaning there is a candy for everyone.